About a year ago, Nicole and I were about to sign up for a Green Architecture class at Wesleyan University, in the Graduate Liberal Studies Program in which we are both enrolled. We had already done a lot of research into green building materials, some of which you have read about in past posts, some still to come. But a major investment was sort of in the works. We knew we wanted to do something big, and for our age, I think seriously considering a photovoltaic (PV) system a year after buying our first hybrid car was certainly big enough. By the time the summer semester began, Nicole had already made some phone calls for information about different systems and we had a few sales reps come out to the house. The problem is, the peak of our roof runs North-South, meaning the slanted sides of the roof face due East and West, the exact opposite of what you want for a PV system. We have dreams of ripping off the back half of the roof and putting a full dormer across the back side of the house, and while trying to draw up plans for that, we went to great lengths to try to design the new roof in such a way as to make it somehow face South. It just wasn't happening. The best we could come up with was about a 2-degree pitch to the South, partially blocked by the peak of the roof during the latter half of the afternoon, and the ideal pitch for PV is 33-degrees, due South. The last company we talked to (we didn't need to go any further) was Solar Wrights, who have an office in Stonington, CT, among others. Dave Cohen (email) was our sales rep and we now consider him a friend. Dave took a look at our roof and really listened to our ideas. He was unlike other people we had talked to, in that he really worked WITH us to design a system that we would be happy with. Dave has a ground-mounted PV system at his house and noticed our large, mostly unshaded backyard. We hadn't considered a ground- or pole-mounted system but as soon as he suggested it we were on board. Our whole yard is a work in progress, much like the house, and Nicole and I both find solar panels to be gorgeous additions to a property, and not something to be hidden up on the roof necessarily. Everyone that has seen them so far agrees. Anyway, We signed a contract in July, 2007 for a 4.2 kilowatt pole-mounted, tilt-able PV system that will produce, on average, all the electricity our house will use. We are still on the grid, and there is no electricity storage system, like a bank of high capacity batteries. We don't have the space (or money) for something like that, and in all honesty we don't often lose power, so going "off the grid" is not really a concern of ours. There will be months that our electricity bill will be a couple of dollars and others that we will have a credit balance. The credits can carry over month after month, in case we continually produce more than we use. After beginning the process with Solar Wrights, we had other projects in the works like overhauling our heat and hot water systems. The new tankless hot water heater we got was strategically electric, so that it will basically run for free. At the same time, however, we had to figure out how the hell to pay for the PV system. Without going into too many numbers, it is very a pretty expensive forray. Almost prohibitively expensive, in fact. Nicole and I do not have a lot of money, far from it. She works part time jobs and I work for a university, both of us coming from middle class families and both have parents that have worked their asses off to give their children better opportunities than they had growing up. We have both learned the importance of saving money and living fiscally responsible. All that said, this is not a financial commitment to be taken lightly. Luckily, the Connecticut Housing and Investment Fund offers an Energy Conservation Loan, which we applied for. It is a 10-year loan and is based solely on debt-to-income ratio, and does not take into consideration any jointly held assets. It does put a lien against the property, however, and would need to be paid off prior to selling the house, if we were ever to sell. The maximum loan amount is $25,000, which may or may not cover the cost of a PV system, depending on the size of it. Think of it like a home equity loan. I think the interest is tax deductible as well, we'll find out next year. Tax credits are available for qualified solar water heating and photovoltaic systems. The credits are available for systems "placed in service" from January 1, 2006 through December 31, 2008. The tax credit is for 30% of the cost of the system, up to $2,000. This credit is not limited to the $500 home improvement cap. Of course, like almost every tax credit, the maximum credit is nowhere near being 30% of the cost of the system. But hey, it's still a size-able credit nonetheless. The only way we ever could have afforded this system, aside from the CHIF loan, was because of the rebate program offered by the CT Clean Energy Fund. They offer rebates for up to 40% of the installed system, based on the efficiency of the panels. The efficiency is determined by the number of modules, size and orientation of the solar array, shading, etc. After being approved for the loan, Solar Wrights has really taken care of the rest, including the rebates. Tonya Morgan has been extremely helpful with all the paperwork, and her husband Charlie did an amazing job project managing the installation. This has been strange for Nicole and I, since almost every project we have done on the house we have done ourselves or with the help of our parents, siblings, and friends. Anyway, when we signed the contract with Solar Wrights, we were aware of the full cost of the system, but really never had to be concerned with the full cost. Your solar installer will take care of the rebates, and they deal directly with the CCEF before even determining the amount you are responsible for. By that I mean, we are not paying the full amount and then getting a chunk back in rebates, we just pay the post-rebate amount, and in our case there was a deposit and then 3 installment payments during the course of the process. Installation: The system consists of two poles, set in a LOT of concrete. The concrete bases required 5' square holes to be dug 9' deep. 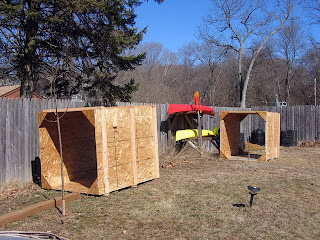 The plywood forms were put in the holes and leveled, with the poles leveled within the forms. 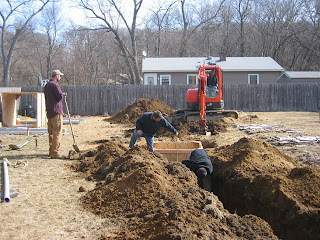 We also needed to dig an 18"-deep trench from the array to the house, for the conduit that would carry the wiring into the basement. This process made a much bigger mess of the yard than I had envisioned, but our yard was already kind of a mess anyway, so who cares. It's worth it. Equipment: On each of the two poles are ten 210-watt SunPower solar panels, for a total of 20 panels. Each set of ten is independently tilt-able, so that in the winter we can tilt them more upright to catch more of the sun's rays, which is lower in the sky. We'll tilt them more horizontal in the summer months. And then in the basement is a SunPower 4000 inverter, which will convert the DC electricity produced by the panels into AC power that can go into the grid. There is also a meter in the basement so we can see how many kWh we are producing on a daily basis, as well as a shutoff switch next to the main panel, so we can turn off the power coming out of the inverter in case we need to work on the electric panel. 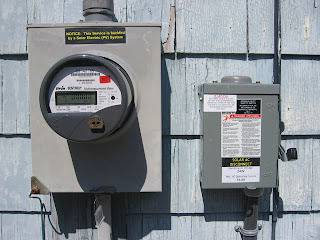 There is another shutoff switch on the outside of the house so that if Connecticut Light and Power needs to work on the power lines, they can shut down the panels so that they won't backfeed into the system and electrocute the workers. Long story short, this is a pretty complicated and expensive process, but if we can do it, anybody can. Before beginning this process, we really didn't know that much about PV systems, but it is such an exciting step to take that we are both happy to talk to everyone we know about it, share what we know, and hopefully make it less complicated for anyone else considering doing this. I appreciate you posted photographs of the new meters on your web site. Now I can see what you were talking about. It amazes me that these actually calculate how much Co2 you are saving (eliminating) from the enviornment each day. I wonder what your neighbors think of the earth-friendly, functional sculpture in your backyard. Oh, make that two - your 8-shaped flower bed is eco-cool too. Can't wait to see what you end up planting in it and what butterflies and birds it draws to your yard. Very exciting, Ryan. Thanks Olivia. The neighbors so far seem to think it looks pretty cool. I am not of the mindset that solar panels need to be hidden on the roof. They are actually quite beautiful. We can see their swimming pool, they can see our solar panels, it's all good! As for the CO2 reading, it's actually the inverter (which converts the DC electricity that the solar panels produce into AC electricity that feeds into the grid) that shows how much CO2 is being saved. After a day and a half the system had saved 60 pounds of CO2 and produced 42 kWh of electricity! 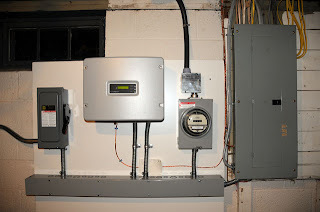 As for the meters, the one in the basement lets us keep track of how many cumulative kWh we are sending out to the grid (the inverter shows how much only for the current day), and the net meter on the side of the house shows the net sum of how much we have used from the grid minus how much we have supplied to the grid. That should, if the system is sized correctly, result in a net reading of zero in the long run. 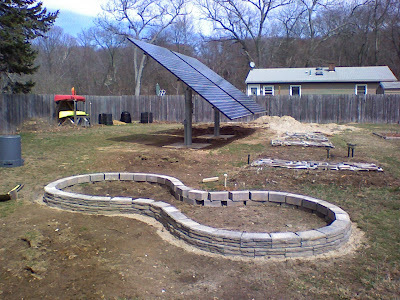 If you have a solar panel party can I "indianait" the neighbor's pool with corn on the cob and eco-friendly meatballs? It's an old hobby of mine. It's a good way to celebrate wind power, actually.